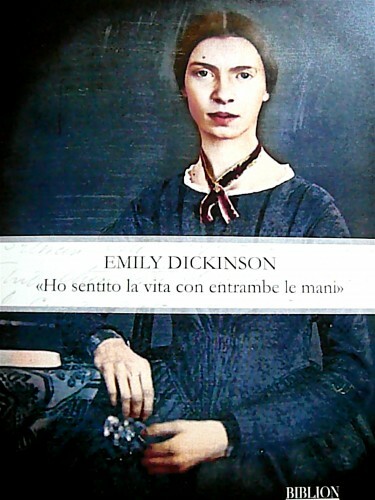 Emily Dickinson’s 180th birthday was celebrated in Florence by a fine series of lectures, musical events, and, of course, poetry readings – Emily Dickinson: “Ho sentito la vita con entrambe le mani” (Emily Dickinson: “I felt my life with both of my hands”). 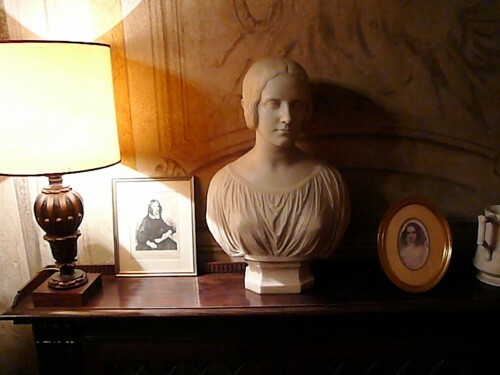 Emily Dickinson - "I felt my life with both of my hands"
The program – the brainchild of Domenico De Martino of Accademia della Crusca and poet Elisa Biagini– used, among other venues, the Casa Guidi, home of Elizabeth Barrett Browning, her husband Robert Browning, and their son Pen. The connection between Barrett Browning, a homebound consumptive, and Dickinson, a sickly agoraphobic, proves that even in the mid-1800s, the world of ideas and poetry was a small place. Dickinson did not publish much before her death in 1886, so it is unclear if Barrett Browning ever knew of her existence. Dickinson, however, had three portraits (postcard drawing, photograph or daguerreotype) of Barrett Browning – one of which was framed and hung on the wall of her bedroom-sanctuary. 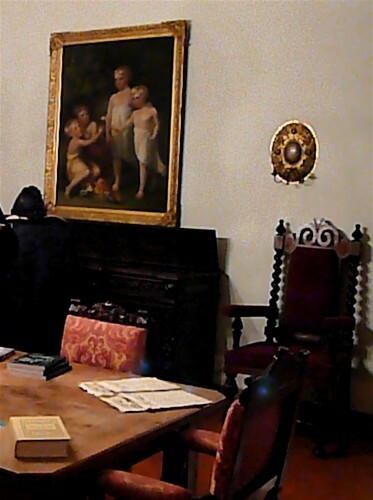 Dickinson also reportedly wore her hair looped over her ears and knotted in back “because it was the way Elizabeth Barrett Browning did” (quote attributed to Dickinson’s sister Lavinia). There are few pictures of Dickenson. 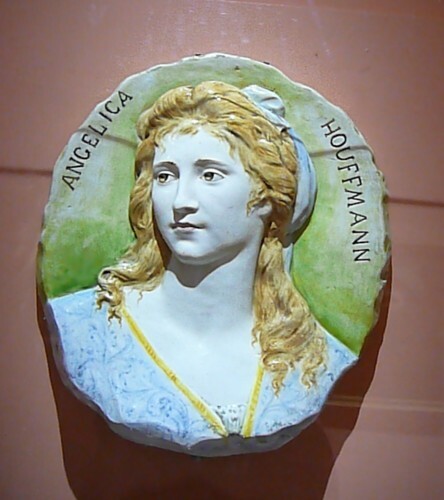 In the one or two widely known, she was certainly less flamboyant in her coiffure than Barrett Browning. 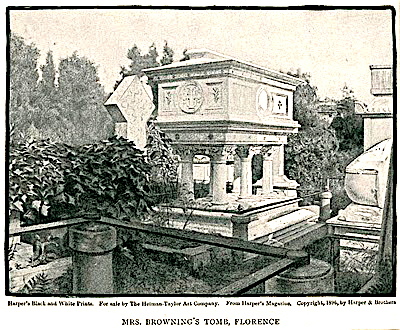 A picture of Barrett Browning’s tomb in the English Cemetery of Florence – perhaps a postcard or cut from Harper’s Magazine -was among Dickinson’s possessions. 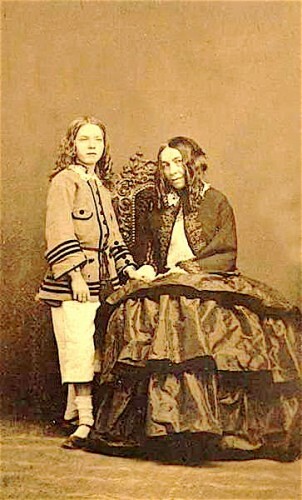 I try to imagine afternoon tea shared these Victorian women of prodigious talent– Emily Dickinson and Elizabeth Barrett Browning – a true meeting of the minds. At the Uffizi Gallery’s free exhibition space, Sala delle Reali Poste, an exciting exhibit has just opened. 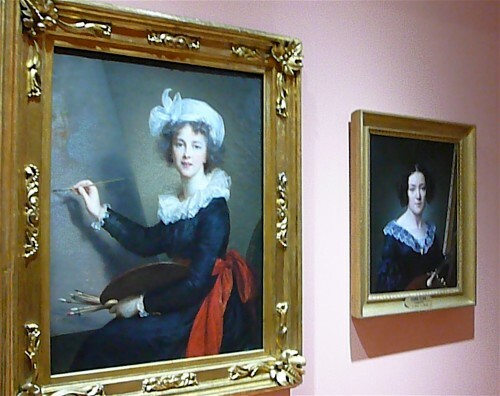 Called Autoritratte: ‘Artiste di capriccioso e destrissimo ingegno’’ (Women Artists Self-Portraits: “Women artists of wit and great ingenuity”), offers a rare opportunity to view eighty of the museum’s historic collection of self-portraits that range from the 16th century to the late 1800s. The quotation in the title is from Vasari’s Lives of the Artists, in which he mentions only one woman, the 16th century sculptor Properzia de’Rossi, whom he praises for her inventiveness and technical skill in being able to carve the entire passion of Christ on a peach stone. Many of the portraits on display at the Sala delle Reali Poste are from the Uffizi’s storerooms and have never been hung in the museum. 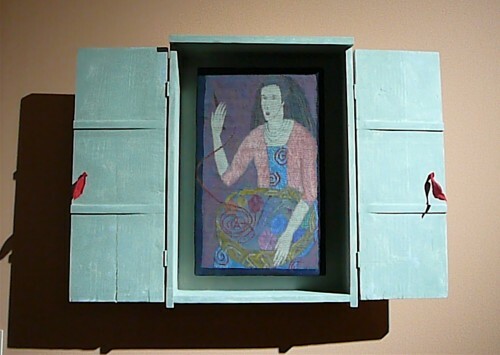 Starting with the “self in the mirror” style of portrait that women painted to dispel the notion that their paintings were “from the brush of a man and of high merit, rather than from that of a woman” (Giuseppe Pelli Bencivenni), the exhibit moves in chronological order to encompass self-portraits executed in a variety of media. 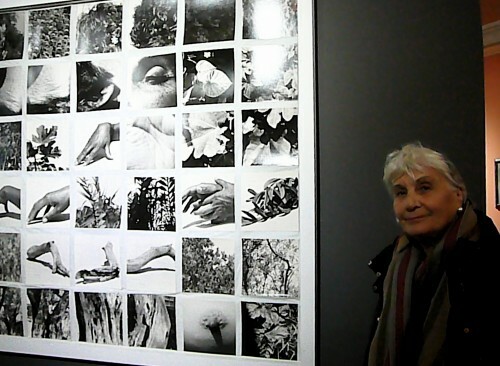 Curator of the exhibition, Giovanna Giusti, director of nineteenth- and twentieth-century art at the Uffizi, has been preparing the show for the last three years. 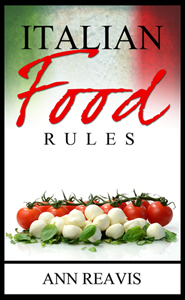 An interview with her in The Florentine sheds light on her choices and motivations. 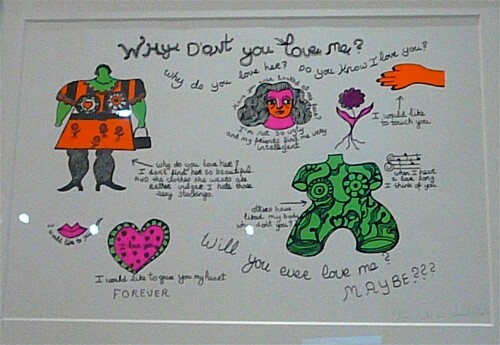 1968 serigraph by Nikki de Saint Phalle - Why Don't You Love Me? 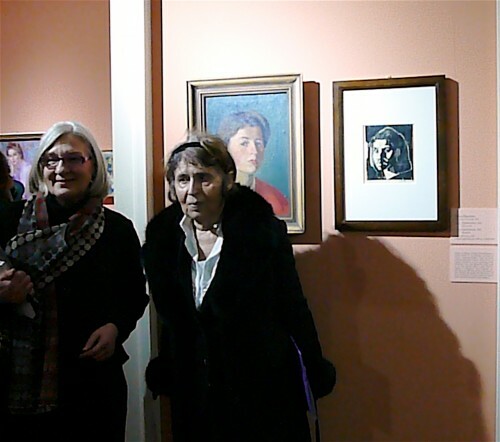 At the opening, both Italian artist, Elisa Montessori and Tinca Stegovec, a Slovenian graphic artist, were present and mingled with the over-flow crowd. Tuesday to Sunday 10am to 5pm; closed December 25 and January 1. Workshops for children on Mondays. I’m embarrassed to say that I have misrepresented an historical fact to friends and family when I pointed out the aqueduct near Lucca and exclaimed, “Isn’t it amazing that those Romans could build something so wonderful, which could last 2,000 years.” It was only a ten-fold mistake, but I should have known better than to guess. It was in the early 1700s that the Lucchesi realized it was necessary to build a large aqueduct to supply the city with water of good quality, replacing water from oft-contaminated wells. From that time, not being ancient Roman hydrologists who had solved the problem hundreds of times throughout Europe, Tuscan mathematicians and hydraulic engineers engaged in lengthy discussions, elaborating various projects that did not lead to concrete results for almost 150 years. 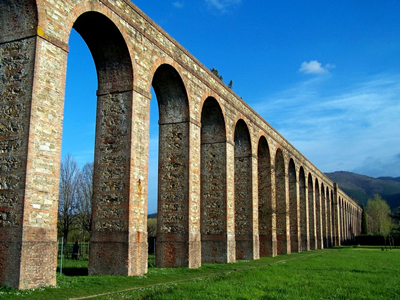 The aqueduct was built only in the following century when Luccese architect Lorenzo Nottolini took into consideration several earlier hypotheses and came up with the best solution. Work began in 1823 and, following several interruptions, the project was completed in 1851. The water was drawn from several springs on the northern slope of Mount Pisano, passed through several layers of stones and gravel to become pure and clear. 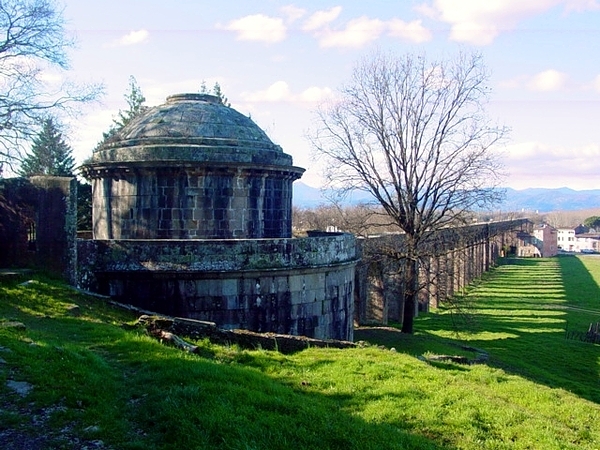 A large part of its conveyance works, built between 1825 and 1840, are still visible today in the parkland of the Monumental Aqueduct of Guamo. Built in an elegant neoclassical style, the little temple-cistern of Guamo collected water from the springs. Inside, it has a basin divided into two parts. Water was channeled inside the conduit that passed over a row of more than 400 arches in brick and masonry for a length of about 3,250 meters, the series of which is today interrupted by the A11 motorway, the road I travel, pointing out the fascinating structure. The water arrived at another temple-cistern – San Concordio – a circular-plan building in the neoclassical style. The water poured from the conduit into a large marble basin; from here it fell into two tunnels containing very large smelted iron tubes, which conveyed the water about 2,000 meters underground into the city and a large fountain in the square beside the cathedral. By making the tubes moveable, Nottolini provided for the effects of the metal lengthening and shortening due to heat and cold, so as to avoid the ruptures that had occurred in other aqueducts. The hydraulic system of the aqueduct was completed by a system of fountains that furnished the urban center. 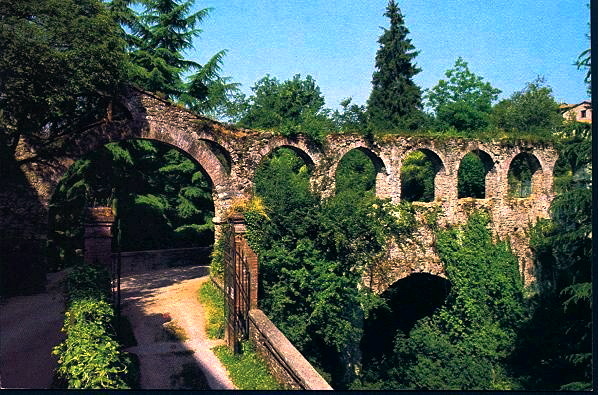 Older aqueducts can be found both north and south of Lucca. They are not Roman either, but they pre-date the Nottolini aqueduct. Built in the 15th century, the aqueduct of Barga is of stone construction (differing from those made of terracotta bricks) that assured water to the fountains in the historical center. Today, a spectacular series of arches can be found in the Parco Fratelli Kennedy (Kennedy Brothers Park), also the site of the medieval moat of the village of Barga. The project for an aqueduct capable of supplying the city of Pisa with the water of the Pisan Mountains near Lucca was ordered by Grand Duke Cosimo I de’ Medici, but credit must go to his son, Ferdinando I, however, for the construction of the long aqueduct, which reach the walls of Pisa from Bottino di San Rocco in the Fonti Valley. Begun in 1592, designed by architect Raffaello di Zanobi di Pagno, who was succeeded by Andrea Sandrini from Siena, it had more than 900 arches and wound along a course of six kilometers. In the 1597 treatise, Dei Bagni di Pisa, famous physician Girolamo Mercuriale considered the aqueduct of Asciano to be among “the almost divine works of Ferdinando I”. 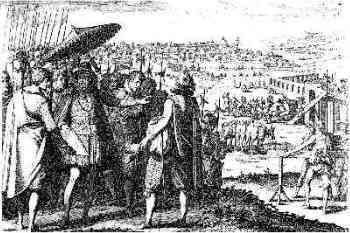 The engraver Jacques Callot depicted the Visita di Ferdinando I ad Asciano in an engraving created in the 1620s, documenting the Grand Duke’s direct interest in the works. 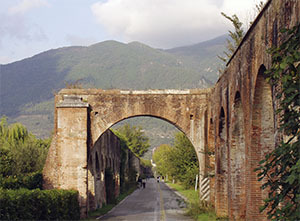 Today, portions of the Medicean aqueduct still stand in the countryside between Asciano and Pisa, providing a picturesque route for walks and cycling. I don’t know why, but when I truly get burnt to a crisp by the often not-so-sunny life in Tuscany, I think of taxi cabs. I’ve done it before and I will do it again. Maybe it helps me realize this too will pass. Right now, we are waiting for the P.M. to ride off into history despite the propping up Hillary Clinton was forced by Wikileaks to do this last week. So I cheer myself up by the realization that the taxi situation in Florence has, hopefully forever, been changed for the better by a new cooperative of all-female taxi drivers – inTaxiFirenze. 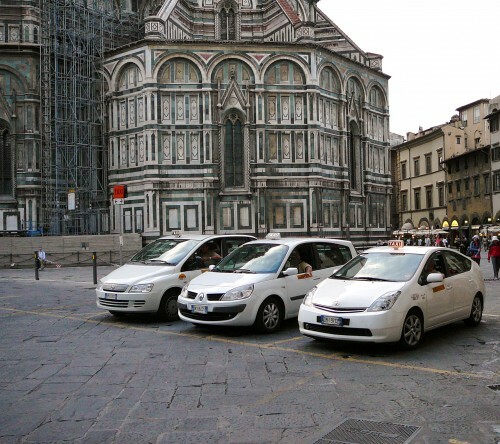 As most visitors to Florence know taxi rides are quite expensive. However, they are also one of the only ways to get home if you’re out past bus hours and far away. Going in groups is one way to cut the cost, but night time rates include an extra fee. Also, in most instances you can’t just flag down a cab; you must call by phone for one or go to a taxi stand (in front of the train station, in Piazza della Repubblica, Piazza San Marco, Porta Romana, behind the Duomo, etc.). Two months ago, I had to call for cabs for ten clients in the rain. To call, you give the address where you need to be picked up to a phone operator and wait for the dispatcher to give the name of the taxi which is coming to pick you up (e.g., “Parigi 23”). The dispatcher will also tell you how long before the taxi arrives, which usually is within three to five minutes. To get three cabs, I had to call three times. On the second call the dispatcher, who had caller i.d., argued with me about whether this was the first cab or an extra. On the third call the operator refused to answer. Supposedly, women traveling alone in a taxi are entitled to a 10% discount between the hours of 9pm to 2am. There is also a discount of 15% for hospital destinations between the visiting hours of 1pm-3pm and 7-9pm. These discounts will not be applied unless you insist on them. But back to the good news. There are nine women who have formed an all-female taxi service in Florence that operates from 5am to 11pm daily. All of the drivers in this new taxi cooperative speak English. Word is that they are becoming quite popular and are getting a lot of negative pressure from the good-ol’-boy network in the taxi union. More information about this service (in Italian) can be found at: www.inTaxiFirenze.it, Their telephone number is longer and not as easy to remember as those for regular cabs, but in a cell phone’s memory it is just a click away: 055 200 1326. InTaxiFirenze also offers a frequent-rider program. After ten rides you get a discount of 5 euro off the fare for the next trip. “Service with a smile” has never been a thought that entered my head when I entered a Florentine taxi until I met the ladies at inTaxi.